The veteran West Aussie throttle masher had to survive an unsettling bump with American Jeff Roth early in the race with the resultant impact taking Roth out and seeing Stubber to sent to the rear. As the lead changed back and forth between numerous drivers Stubber took his chances and wheeled the #31 Palice Property Group Rocket back towards the front and when the chequered flag fell the dual Australian road racing champion can now lay claim to an Australian title on clay as well. The race had everything, and then a bit more. Leaders looked to be home and hosed, and then fell by the wayside with either race damage or mechanical failure. Victorian teenager Cameron Pearson showed maturity beyond his years with a fine second place after starting on pole in his HDD #10 Rocket then falling back through the field a little and then holding his head to cruise back to second at the finish. West Aussie youngster Jay Cardy scored a career best third place finish with a sterling drive to move through the hazards and still maintain strong speed after coming from the seventh row of the grid. John Lodge Jr clearly has an enormous future in the sport, remarkably speeding to the lead from position nine in just his fifth outing in a Late Model. Godsey got by the Kurri Kurri youngster and lead but a restart saw Lodge bounce off the infield berm and into the path of the hapless American leader taking him out in the process. Godsey later paid tribute to his young rival despite his own DNF in the process. “That boy is a great racer, what a talent in only like his fifth event. Of course I’m disappointed in our crash but he showed a lot of class to come down into my pits and apologize after the race,” said Godsey later. 2017 Australian Champion Callum Harper looked poised. Unfortunately he rode over the back of then leader Cameron Pearson coming out of turn two and crippled the #22 Black Diamond before he could show the potential of his speed and craft. Jeff Roth looked undeniably racy but an incident in the same corner several laps earlier saw Paul Stubber get into the side of the American which crashed the Arkansas hard charger out early in the event and send Stubber to the rear for being the cause of the stoppage. Robbie Farr, unbelievably, came from the eighth row of the B-Main to make the transfer, then start from position #21 to eventually work himself into the race lead only to blow a right rear tyre with only a handful of laps remaining. South Australian Ryan Alexander stormed to the lead after coming from the rear when he had to use a pit stop to repair the #36 only to heartbreakingly run out of fuel with precious few laps to go. Stubber, the opportunist, saw his chance and ripped through to the lead and was an elated winner as he received his accolades from the inaugural Australian Late Model Championship winner Allan Butcher in victory lane. Ben Nicastri came from the eighth row of the grid to score an impressive fourth place finish in the 3-99 Motorsport Barry Wright Racecar with Nathan Disney being consistent for his fifth place result. There were several personal bests in the race too with the Hickeys having plenty to celebrate. Katelyn Hickey was in the top ten in every race she contested including the Championship A-Main where she placed a gutsy ninth place. Michael Hickey survived the carnage to come from an incredible 22nd position for an eventual eighth place result. Defending champion Darren Kane’s title was enough to make the toughest man cry. The IBRP Dominator suffered many misfortunes throughout the weekend and the team was forced to take a provisional 24th place start in the final as the changed a rear end after a DNF in their final heat. Kane was making progress through the A-Main but ran into the back of Ryan Alexander which further damaged the #1 and saw him register a DNF finish after a brutal two nights of competition. 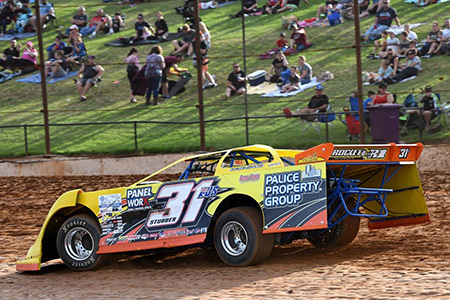 The AMCA Nationals played support to the Late Model title with Raymond Kime taking a strong win in the A-Main from Terry Pankhurst in second place and Daniel Roberts finishing third.